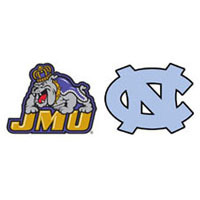 The James Madison University football team will have five home games along with a road game at Football Bowl Subdivision school North Carolina on its 2011 schedule, announced today. Time for the home games will be announced in the coming weeks. Coming off seven straight winning seasons, JMU will open the season on the road in Chapel Hill, taking on the Tar Heels on Sept. 3. This will be the second-ever meeting between the two programs. The Dukes will then return home to open the renovated and expanded Bridgeforth Stadium on Sept. 10, hosting Northeastern Conference runner-up Central Connecticut State. A road trip to four-time defending Big South Conference champion Liberty is next on Sept. 17 to wrap up non-conference action. Madison heads on the road to open Colonial Athletic Association play, traveling to Williamsburg, Va., to play defending CAA co-champion William & Mary Sept. 24. JMU then comes back to Bridgeforth for a three-game homestand, starting with Richmond on Oct. 1 for Homecoming. The Maine Black Bears follow on Oct. 8 with the third being the Family Weekend contest against Villanova on Oct. 15. Following an off-week, the Dukes will make their first trip to Norfolk to take on CAA-newcomer Old Dominion, Oct. 29. Another road game follows at New Hampshire, Nov. 5., before JMU returns home for Senior Day on Nov. 12 against Rhode Island in the Rams first trip to Harrisonburg since the 2006 season and the first meeting since 2007. The regular-season slate wraps up on Nov. 19 at Massachusetts.